Sprawling across 35 acres, Industry City occupies 16 buildings and six million square feet along the Sunset Park waterfront. Formerly a 19th century warehouse and distribution center known as Bush Terminal, which fell into disarray in the 1960s when urban manufacturing declined, this complex has recently undergone a $1 billion transformation. Reborn as an “innovation ecosystem” for the arts and a dining mecca with an eclectic mix of creative purveyors, event space, workspace and artist studios, ample shopping, and a 40,000 square foot food hall, there is something here for everyone. Image courtesy of Industry City. Through February 2019, Experience the Life and Works of M.C. Escher is an immersive and interactive exhibit featuring more than 200 mathematically inspired, illusion-filled, and renowned works from one of the greatest graphic artists of the 20th century. Japan Village. Image courtesy of Industry City. Transport yourself to Tokyo as you step inside the newly opened Japan Village (think ‘Japanese Eataly’), housing a large Sunrise Mart for imported Asian-brand groceries, drinks, and snacks, and multiple booths specializing in Japanese food staples. Enjoy ramen-centric dishes at Setagaya or soba/udon at Gohei. Order deep fried tempuras at Shokusaido or Moriya. Try the onigiri at Obentoyasan for just $3 to experience the savory fulfillment of umami, the fifth flavor beyond salty, sweet, bitter, and sour. Plans are already underway for an expansion this summer of imported cosmetics, paper goods, and pottery from midsize Japanese exporters, who might otherwise not have the means to offer their products overseas. Extended hours and more food vendors, including a sushi bar, will be coming soon. Every Saturday, your family can enjoy a free interactive concert series, Rock and Roll Playhouse presented by Brooklyn Bowl, featuring live music covering songs of iconic bands such as the Beatles, Led Zeppelin, The Grateful Dead, Bob Marley, The Rolling Stones, and many more. Dreamland Roller Rink. Image courtesy of Industry City. 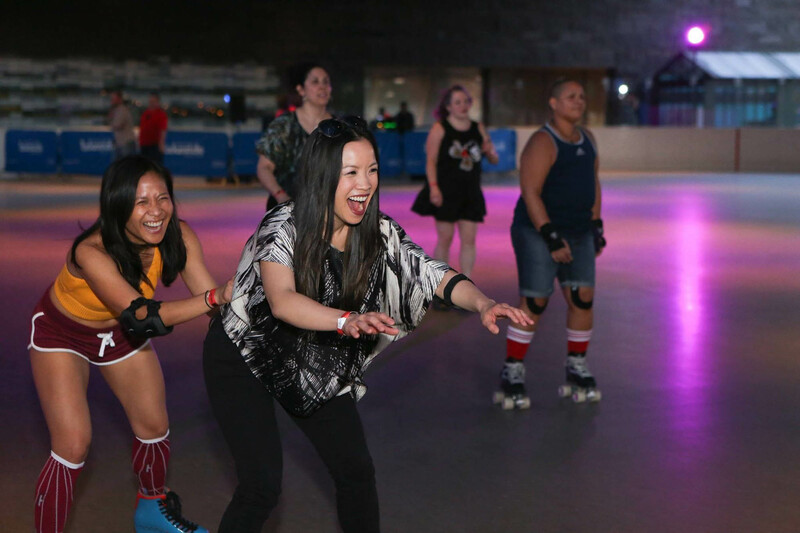 Every Sunday from 1-4pm, you can dress up, lace up, and skate to disco’s greatest hits from the 70s and 80s at Dreamland Roller Rink’s Dreamland Discoteque. In warmer weather months, embrace the tranquility of a waterfront view and get your “om” on with Sunset Yoga in the Courtyard, or join an Everyday People Dance Party, or celebrate independent movies at the Rooftop Film Series on weeknights and weekends. Try a date-night cooking class at The Brooklyn Kitchen’s Industry City outpost, and learn to cook like a grown up. They offer classes ranging from basic knife skills to making pizza dough at home to small animal butchery, and everything in between. For more info, check out Industry City’s calendar of events. Yaso Tangbao brings you Shanghainese street food and is renowned for their soup dumplings, which are some of the best in the city. Burger Joint. Image courtesy of Industry City. The popular Burger Joint hidden inside the lobby of Le Parker Meridien has arrived in Brooklyn. 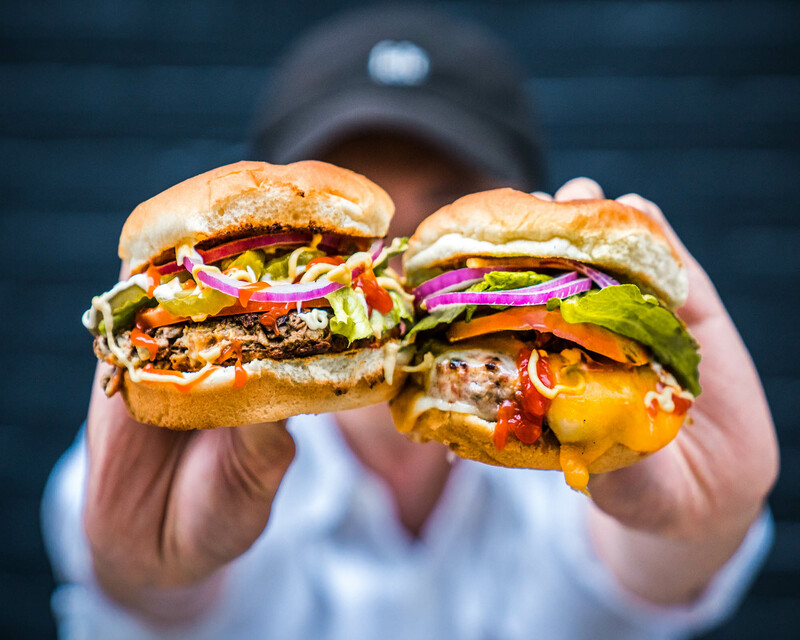 Their burger ranks in the top 3 in the city on Eater’s roundup. Erkan Emre was an established architect, when his craving for authentic Berliner döner kebabs (and an inability to find any in NYC), led to a thriving business selling his favorite childhood street food at Kotti Berlin. Ejen, which translates to “now/this moment forward,” offers Korean comfort food classics. Also established by a former architect, who missed her mother’s homemade cooking, Jenny Jiae Lee brought her parents from her native Seoul to Brooklyn to recreate food dreams from her childhood for all of us to enjoy. You might have seen Avocaderia featured on Shark Tank (securing investments from Mark Cuban and Barbara Corcoran). Popular since it’s inception, this avocado-only restaurant developed from a series of Instagram posts, and you’ll now find lines snaking around the corner during lunch hour in anticipation of fresh Mexican avocado prepared in a variety of tasty ways. Taco Mix offers acclaimed al pastor tacos, which rank in the top 3 in the city on Grub Street’s roundup. If you’re in the mood for a slice of coal oven pizza, head to Brooklyn-favorite Table 87. Colson Patisserie. Image courtesy of Industry City. Colson Patisserie offers a wide selection of delectable artisanal French-Belgian pastries, including their famous croissants, in addition to sandwiches, salads, coffee, tea, and more. Ends Meat is a nose-to-tail salumeria with a selection of locally-sourced dry cured meats originating from family farms in New Jersey and prepared using traditional Italian styles and methods, making for tasty and filling sandwiches. 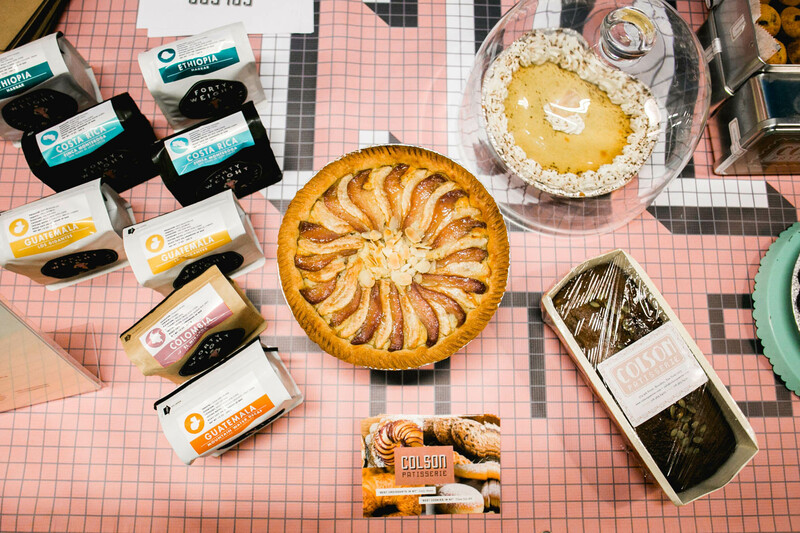 Pickle Shack is a vegan café and pickle shop offering healthful, seasonal, and fermented foods. An Italian café that doubles as a bicycle repair shop, Maglia Rosa, serves up fresh paninis and pastries sourced from Italian vendors, local bakeries, and local farms. If you prefer to be served a sit-down meal, head to Filament at the Landing, a gastropub from chef Vincent Chirico (of Vai fame), with selections such as hamachi, charred octopus, and chicken under a brick, presented in a lofty, modern, light-filled space outfitted with shuffleboard and pool tables. For dessert, you truly can’t go wrong with anything served at One Girl Cookies, Blue Marble, or Li-lac Chocolate. Billy Durney, former bodyguard to the stars, now famous for his Hometown Bar-B-Que, will be opening Hometown Deli, where corned beef and pastrami sandwiches will be served on classic rye. The ever-popular James Beard award-winning Middle Eastern specialty market Sahadi’s, serving Brooklyn since 1948, will open an Industry City outpost offering groceries, prepared foods, a bar, seating and event space. The Frying Pan Helm Bar offers cocktails and seafood (try the lobster rolls and poke tacos) with a 9-table indoor ping-pong hall, a 9-hole outdoor mini golf course, and an astro-turf lawn for lounging in the warmer months. In the colder months, enjoy food and drink service from Helm Bar inside Hygge Haus, “a Scandi-inspired indoor/outdoor experience designed by David Stark,” resembling a large teepee with a cozy winterized tree-scape of evergreens, wood stoves, blankets, and twinkling lights. If you prefer to drink your cocktails from whole coconuts, head over to Bangkok B.A.R. for a variety of Thai specialty drinks and cuisine. Brooklyn Kura. Image courtesy of Industry City. 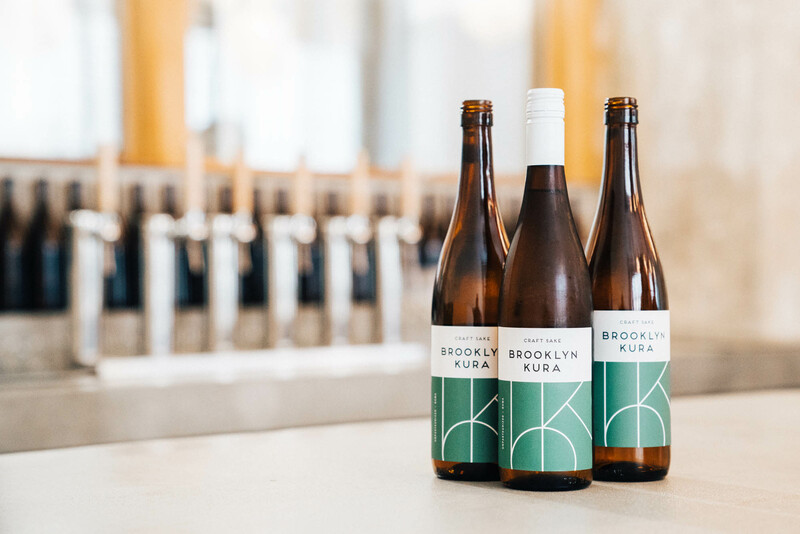 Brooklyn Kura is an American craft sake brewery and tasting room with a revolving menu of sake on tap and light fare including charcuterie, cheese, fried fava, and toasted nori. 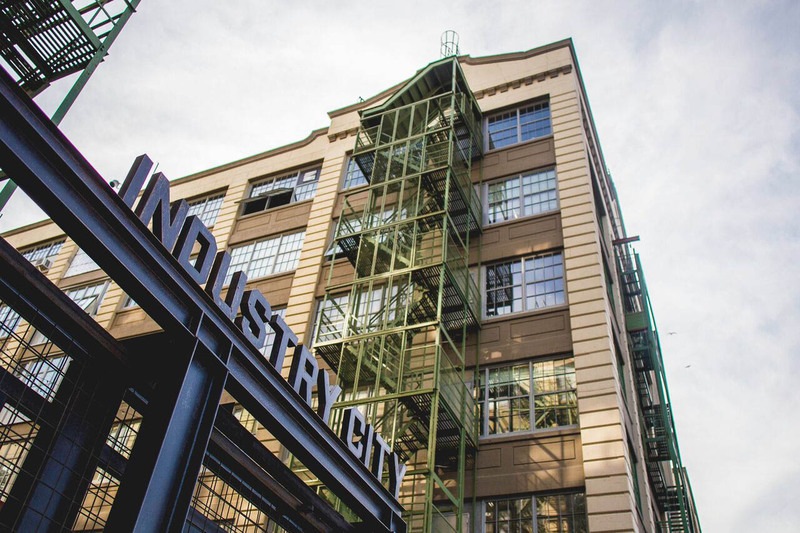 Industry City Distillery is a distillery and tasting room serving up the only vodka made in NYC, boasting spectacular 2nd floor views and a behind-the-scenes tour and spirits tasting every Saturday at 3pm. Moore Brothers is a wine store specializing in natural artisanal bottles from sustainable vineyards. They offer a wide variety of tasting events. ABC Carpet & Home. Image courtesy of Industry City. 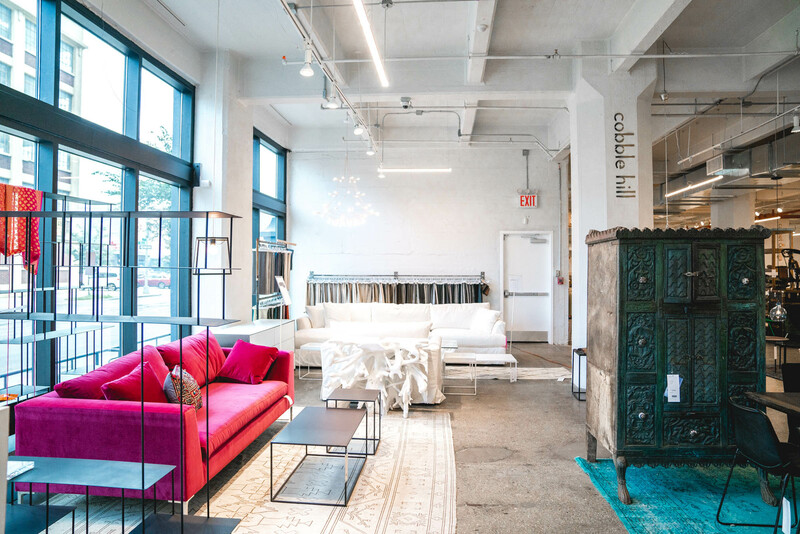 ABC Carpet & Home offers wares from NYC’s iconic home goods store, including furniture, rugs, tabletop decor, linens, and more. Arcade By Current Affair is a vintage concept shop with expertly culled vintage clothing from dealers across the country. Brooklyn Flea is Brooklyn’s largest flea market with vintage goods, food, and antiques; open every Saturday from 10am-5pm (indoors in the winter months). Design Within Reach Outlet offers the opportunity to find high-end DWR furniture at a substantial discount with an evolving assortment of overstocked, returned, or slightly damaged items on display. Flavor Paper is the hippest wallpaper store in existence; also featured in our previous post, Not Your Grandma’s Wallpaper. IC Store by Wanted Design offers a curated range of beautifully designed gifts, housewares, ceramics, jewelry, toys, and more. Mitchell Gold + Bob Williams is a modern home furnishings outlet boasting top-quality sofas using American-made and earth-friendly materials. Restoration Hardware Outlet offers markdowns and deals on RH home furnishings. Teressa Foglia is a modern handmade-to-order custom hat shop. 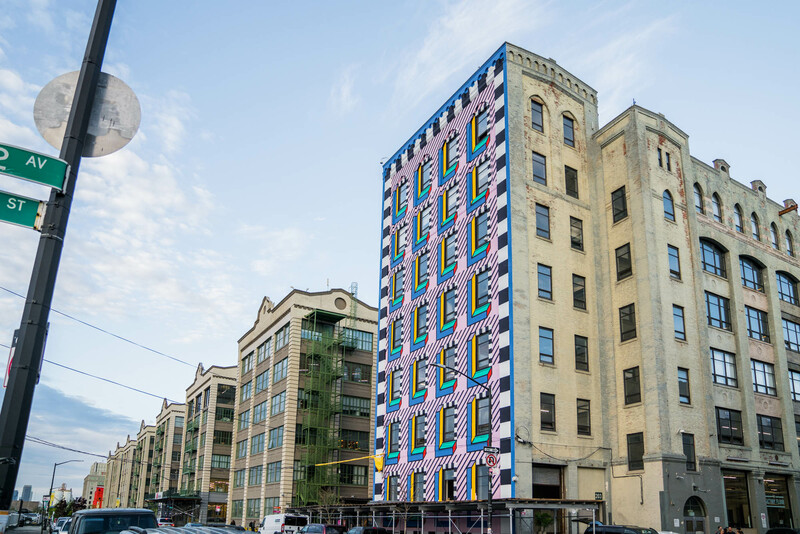 Industry City is easily accessible via the D/N/R to 36th Street and walking towards 2nd Avenue. It is one stop from Atlantic Terminal and only three stops from Union Square. If you prefer to ride a bike, you will find ample racks onsite and can always inflate a flat tire at Maglia Rosa. Check out this interactive map of all the ways you can get to Industry City, including travel times.